Define the payroll options at the current location. If you select 'Twice a month' as your payroll period, additional entry areas appear allowing you to designate the 'Last day of the moth included in your first payroll each month' and the 'Last day of the month included in your second payroll each month'. Bimonthly payroll is typically paid on the first and fifteenth day of the month, but does not include hours worked up until those dates since time is needed to prepare the payroll. For example, payroll on the first of the month might include hours worked from the 25th day of the prior month through the ninth day of the current month, and payroll on the fifteenth might then include hours worked from the 26th day of the prior month through the tenth day of the current month. The 'Twice a month' payroll period end days menus allows you to designate the cutoff date for each of the two payroll periods in the month. Sample payroll start date: Click the drop down menu and select the date of the first day of any prior or future payroll period. The actual date does not matter as long as it is correctly identifies the date of the first day of any payroll period. Use payroll close dates for confirmation reminder notifications sent to providers: Hours confirmation reminder to rely on the payroll period end date duration for 'Every week', 'Every 2 weeks', and 'Every 4 weeks'. Many emergency departments have shifts that start before midnight of one day and end in the next day, with the hours of a single shift worked in two separate days. If the first part of this shift is worked on the last day of a payroll period, the remaining hours of the shift (those after midnight) are technically worked in the first day of the subsequent payroll period. Different groups vary in how these hours are paid, since they could reasonably be included either in the payroll period in which the shift started or in the actual payroll period in which the hours were worked. ByteBloc allows you select one of these two options your group uses. We pay overtime for one or more shifts: Some groups pay more than the usual base pay for hours worked beyond the normally scheduled hours of a shift. For split shifts, pay overtime only if the total number of hours worked by a provider is more than the total number of hours in the shift: Select this option if you want the hours worked in a split shift to be paid at an 'Overtime rate' ONLY if the total worked hours by a provider in a split exceed the total hours in the shift when it is not being split. If this check box option is NOT selected, hours worked beyond the normal beginning or ending shift times will be paid at an 'Overtime rate' if an applicable 'overtime payroll category' has been defined. If this check box option is NOT selected, hours worked beyond the normal beginning or ending shift times will be paid at an overtime rate if an applicable overtime payroll category has been defined. 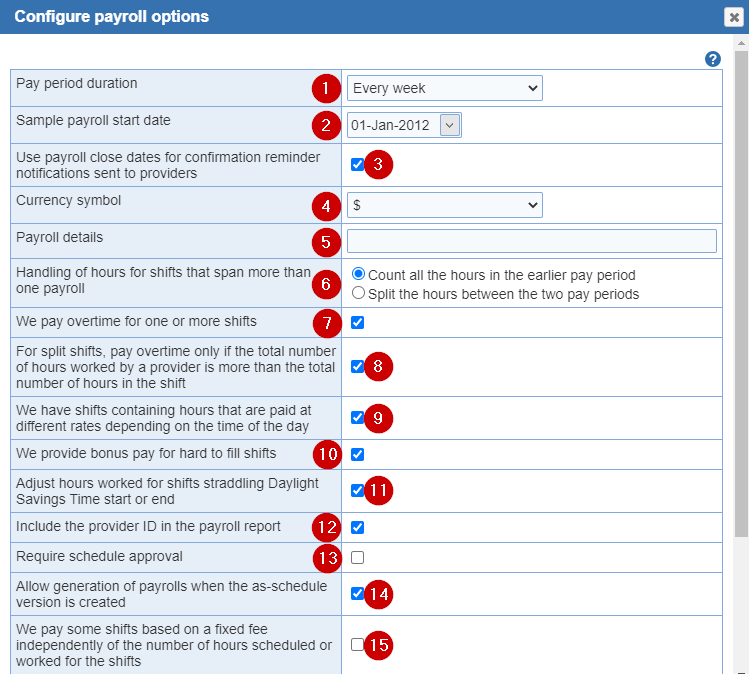 In the 'Define Pay Categories' screen, when setting up your summary categories you will have the option of defining overtime payroll categories, such as 'Overtime Night Hours', which allows you to set the pay rate for each provider when they work beyond the normally scheduled hours of a night shift. Example: The scheduled hours for a shift are 6:00 a.m. - 3:00 p.m. Suppose that Dr. Brown and Dr. Smith have split this shift with Dr. Brown scheduled from 6:00 a.m. - 10:00 a.m., and Dr. Smith from 10:00 a.m. - 3:00 p.m. Overtime is paid at 1.5 times the 'Base pay' rate. You have checked 'We pay overtime for one or more shifts', and created a 'Base pay Overtime Hours' (Total Overtime Hours) payroll category. If it is busy and Dr. Smith ends up working 10:00 a.m. - 5:00 p.m., the two hours worked from 3:00 p.m. - 5:00 p.m. are paid depending upon whether the 'For split shifts, pay overtime only if the total number of hours worked by a provider is more than the total number of hours in the shift'. We have shifts containing hours that are paid at different rates depending on the time of the day: These shifts straddle pay categories. Example: Some groups pay at a higher pay rate for working night hours, but pay this rate only for the hours worked between 10:00 p.m. and 6:00 a.m. If a group's night shift is a twelve hour shift scheduled from 9:00 p.m. to 9:00 a.m., the hours worked from 9:00 p.m. to 10:00 p.m. and from 6:00 a.m. to 9:00 a.m. (total of four hours) would be paid at the normal hourly rate, while the eight hours worked from 10:00 p.m. to 6:00 a.m. would be paid at the higher night pay rate. If your group does something similar for weekends, nights, holidays, etc., please select this option. When this check box option is selected, the 'Define Pay Categories' screen will offer the option of defining the start and end times to which each payroll category applies. For the example above, you would create a 'Night Hours' payroll category, allowing you to set the pay rate for each provider when they work a night shift with hours that fall between 9:00 p.m. and 6:00 a.m. Important Note: If you elect to include only some of the hours of a shift in a payroll category, ByteBloc's summary of hours worked may be different from the hours calculated for payroll purposes. For example, the normal ByteBloc summary allows you to total Night Hours worked in your night shifts, but does not allow subdivision by specific times as is offered by the 'Handling of hours for shifts that span more than one payroll' setup option. We provide bonus pay for hard to fill shifts: A default bonus pay can be defined at the level of a 'shift' or 'Edit hours or assignment'.The bonus pay is added to the hourly based pay computed for providers. For shifts that are split, the bonus pay is prorated between the providers who worked the shift. The default bonus pay carries over to the corresponding shifts in each new schedule. Adjust hours worked for shifts straddling Daylight Savings Time start or end: Automatic adjustments for daylight savings time. When this option is enabled, the duration of shifts that straddle daylight savings time is adjusted automatically. Such shift are lengthened by one hour for the fall transition and shortened by one hour for the spring transition. Include the provider ID in the payroll report: (Optional) This can be used as a unique identifier or you can use an employee id to track. To report, enter an external id within the 'Staff' > 'Edit User' > 'Privileges' tab for each provider. Withholding: (Optional) Withheld pay can be computed as a percentage of gross pay.